Where’s all the baseball fans out there?? Fans of the big leagues or the little leagues will love this barnwood baseball wall decor that’s simple and inexpensive to make. 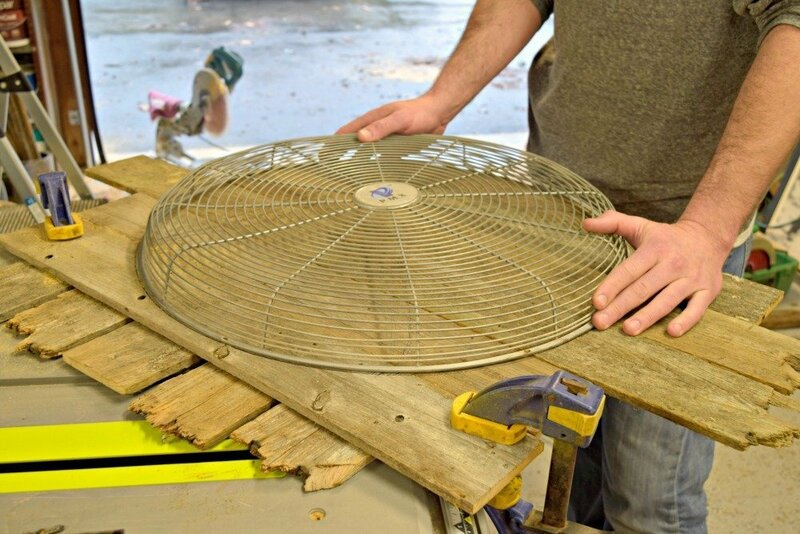 We made this from some reclaimed barnwood, but in case you don’t have that just laying around in the garage.. no worries! 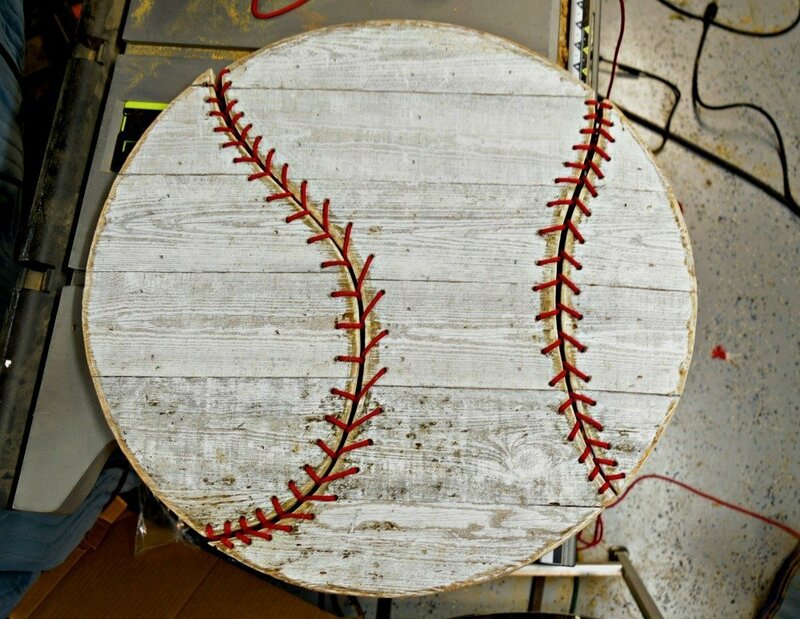 You can make this out of any scrap wood or the new shiny wood from the good folks at Home Depot or Lowe’s. Baseball season is approaching y’all. We have a little baseball fan in the family now and she’s got a swing that will knock your socks off. 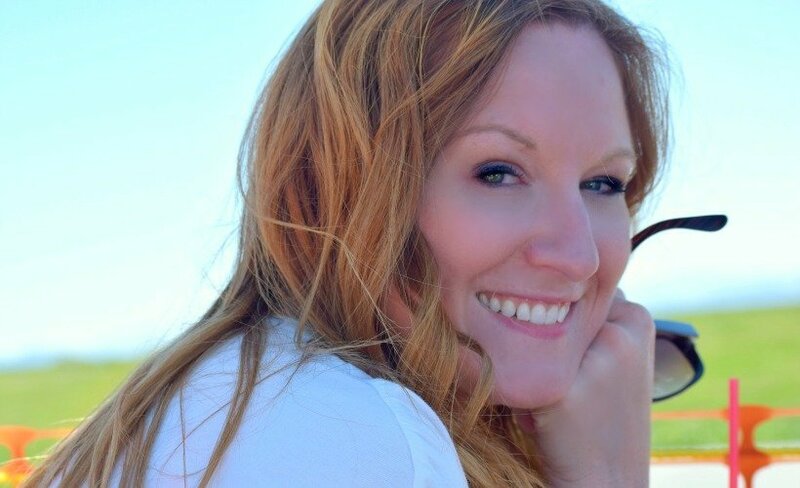 That’s right… I said SHE!! So for her 7th birthday, we wanted to decorate her room in her favorite sport ’cause you know we are her biggest fans! 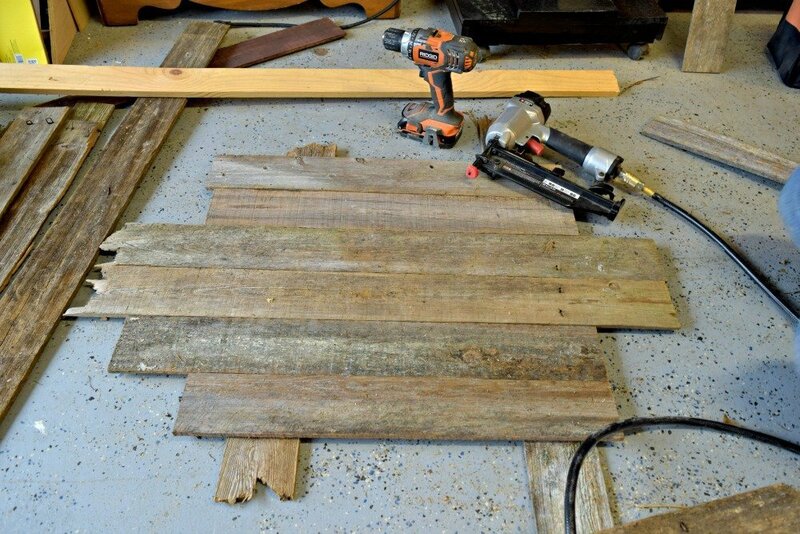 😉 Let’s start with some reclaimed barnwood. We actually got all this wood from our neighbors! If you read my last post, I mentioned I’m in a new house now. Right up the road is a little farm with a TON of barnwood just sitting there. Sitting. There. Farmer Sherman was so generous to let us have whatever we wanted. 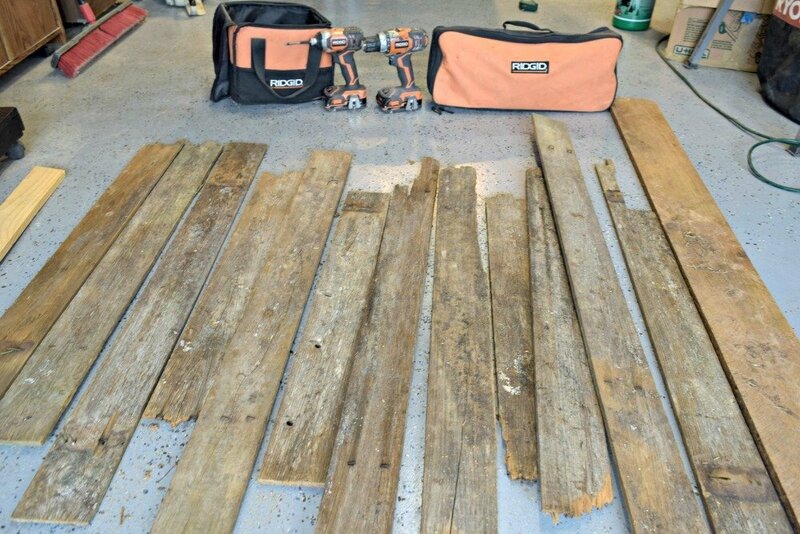 I truly don’t know if Sherman knows what a treasure he has around him, but to do him honor, we are going to put this reclaimed wood to good use! Let’s get busy building! 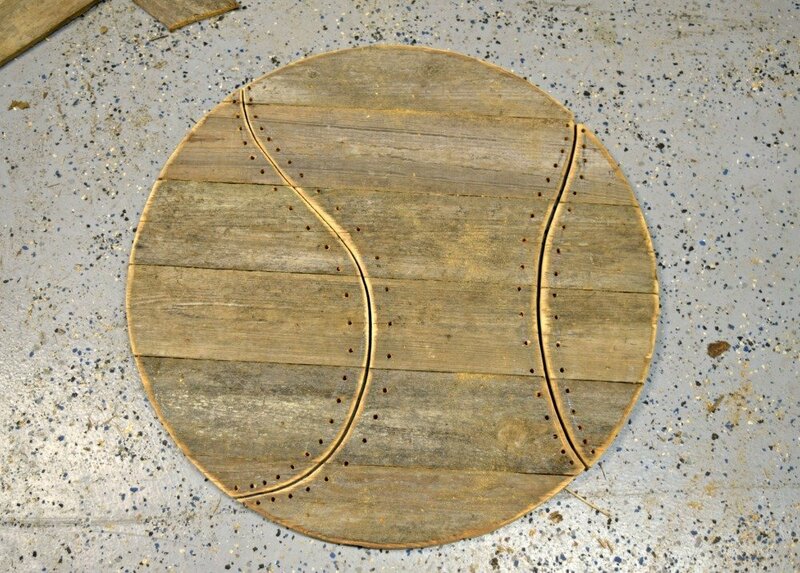 But for what it’s worth, we used 6 planks of wood with two planks behind them to brace and cut a circle measuring about 24″ in diameter. Time to cut this baby out!! 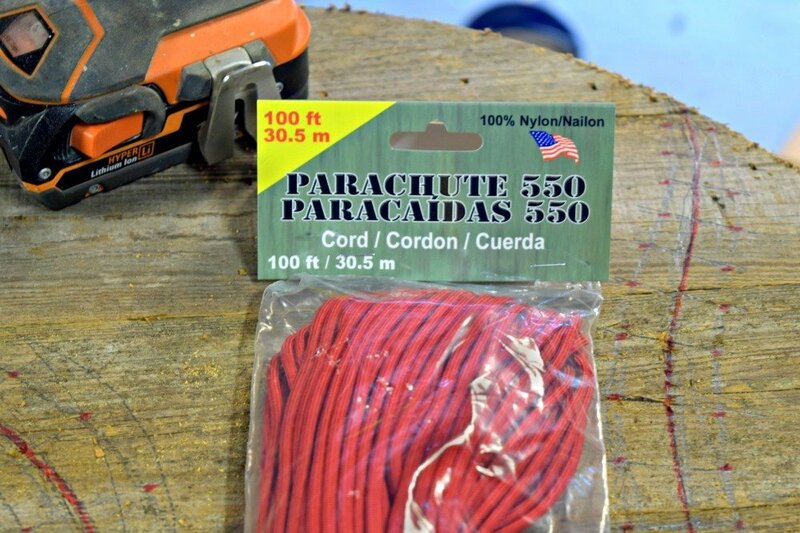 Disclaimer: Here at Creatively Southern we believe in safety first. Always wear your safety goggles when working with power tools and feet first… first time when jumping in the pool! 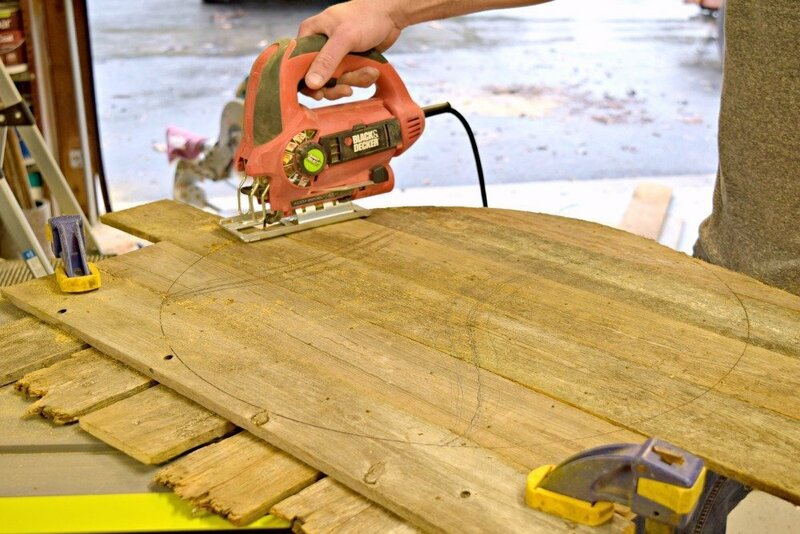 Once your done cutting you either have a fantastic barnwood serving tray (hey, there’s an idea!) or something that resembles a baseball. Now we just need to draw some laces on here. Given that I have little to no artistic ability, I let the expert handle this. He has an eye for this stuff but if you need a little help, grab a baseball to get some perspective and guidance on this one. We could stop right here, slap some paint on, and call it done, but then where’s the fun in that!? 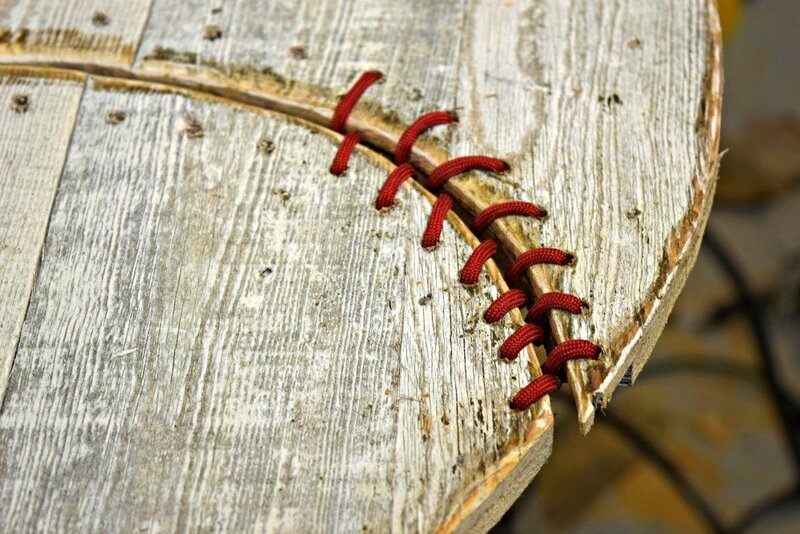 We decided to we would cut our baseball in three separate pieces. See those rustic edges? Sets it off doesn’t it? 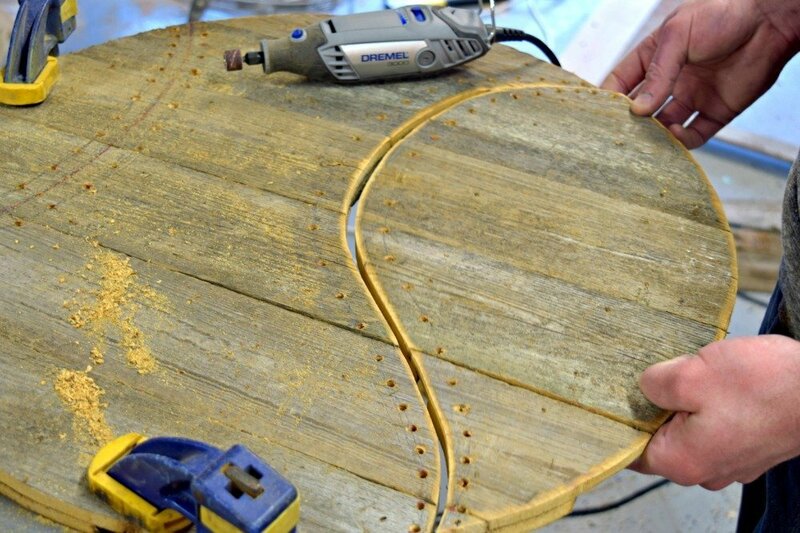 We used the this fantastic little Dremel tool to sand down the edges where we cut to smooth it out. 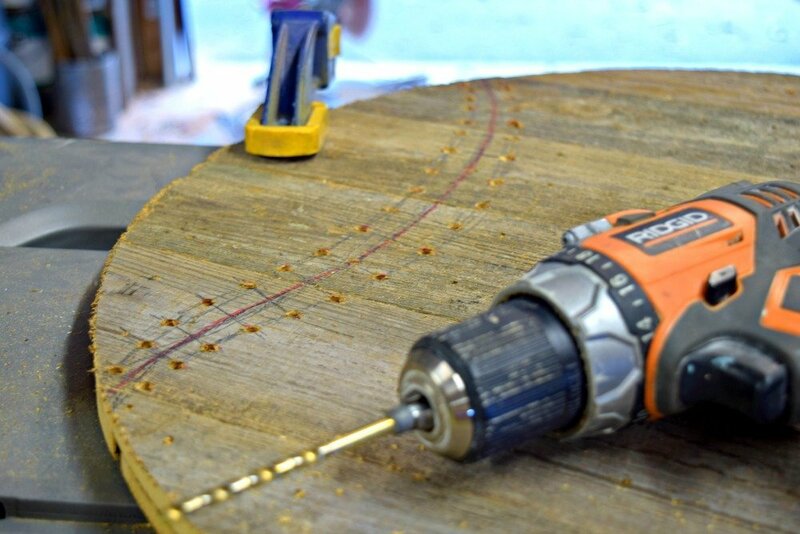 It adds dimension and any excuse to use the Dremel will do!! 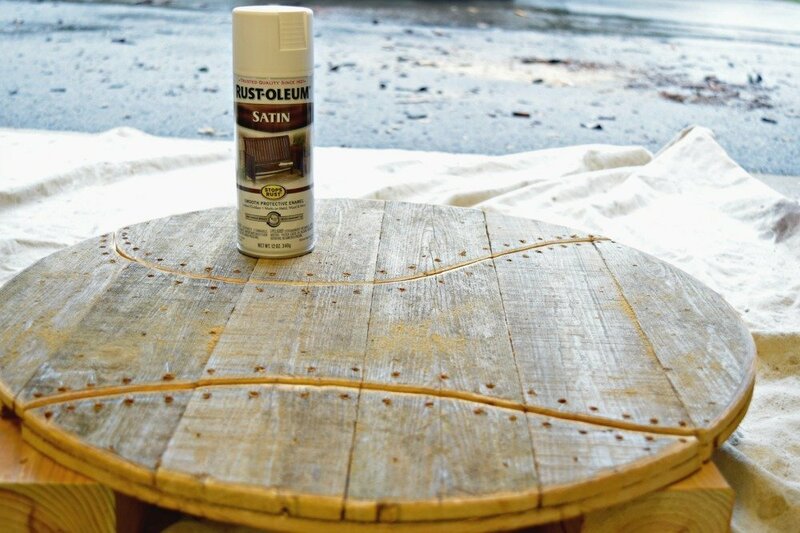 Next we grabbed a can of our favorite spray paint and sprayed a light coat of Rust-oleum white satin over the wood. By light coat, I mean long swoops of spray paint 1 to 2 times across. You want some of the wood to still show through. Here’s the tricky part. Tie a knot in one end of your cord. 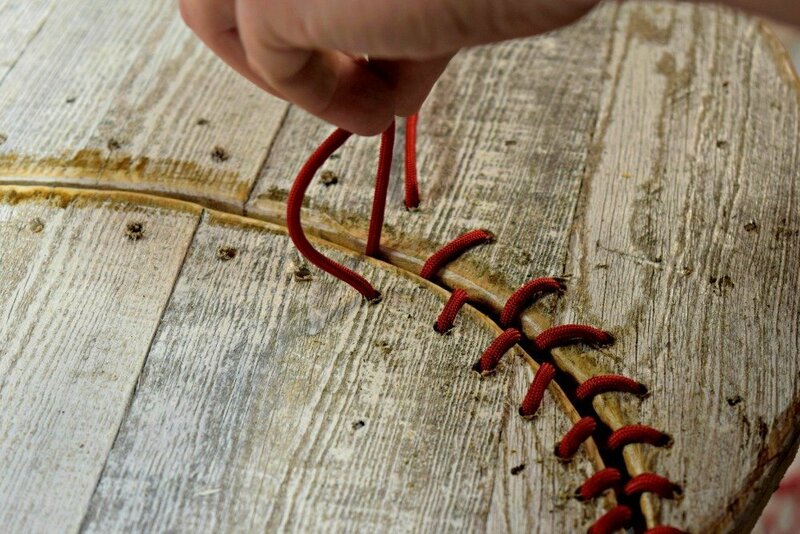 Push that up through one of your drilled holes on the end of your baseball. Then you’re going to take that end and run it through the middle of your two cut pieces. and back up through another drilled hole on the opposite side. 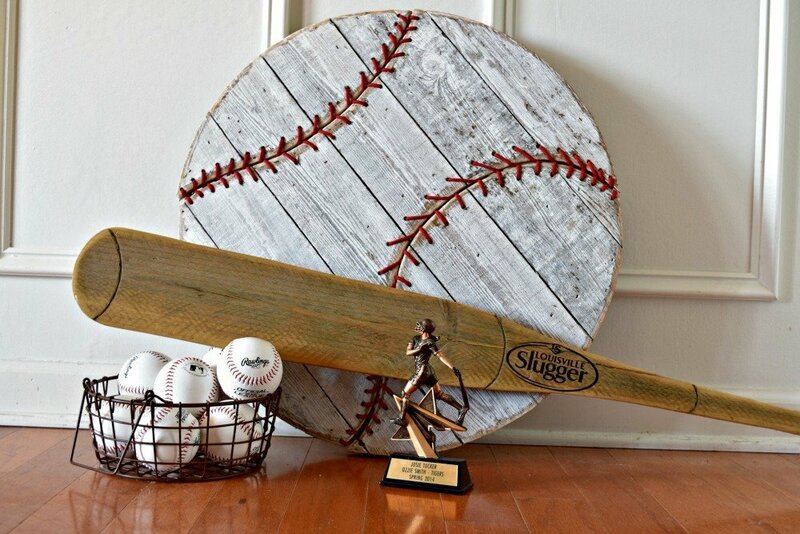 Hey, if you can lace up your tennis shoes, then you can lace up this barnwood baseball. After lacing a small section, we went back and tightened up the laces to see how it was coming along. Not bad… not bad!! Keep your patience and your wits about you and don’t give up! 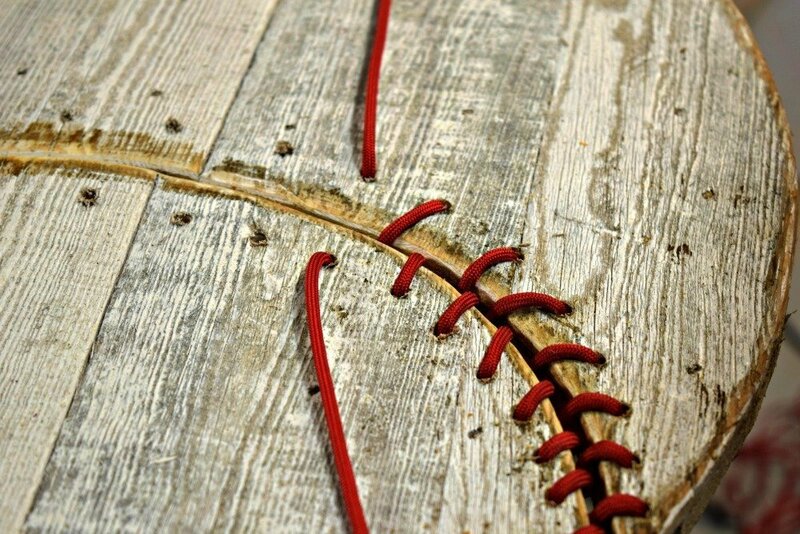 Once you reach the end of one side, tighten all of your laces and tie a knot underneath to secure it. Then… rinse and repeat on the other side! 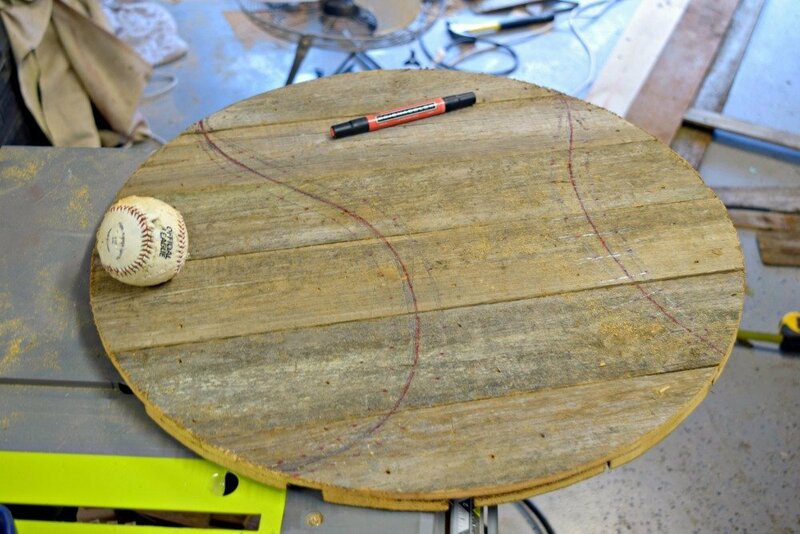 🙂 In the end, you will have an authentic barnwood baseball wall decor!! We had some picture hanging hardware that we mounted on the back so it could hang on the wall. Then you’re all set!! One of us got really creative and freehandedly (that is a word!) cut out a baseball bat to go along with the theme. Then we used our well-oiled Silhouette cutting machine to create the “Louisville Slugger” label.